Marketers may invest in tools, but there are other revenue-producing assets that we often overlook, specifically: content, brand and data. 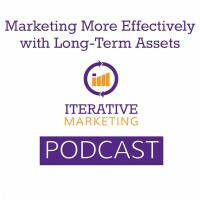 What three long-term assets will make your future marketing investments more effective and why is it important to focus on long-term assets? These assets will drive revenue for a longer period of time than tools and other things we use in marketing. What makes content a long-term asset? We are referencing evergreen content that generates revenue, either directly or indirectly. Evergreen content is often “how to” content or similar references and tools. Direct revenue-generating content has a call to action, while indirect revenue-generating content helps to build a brand, or build and/or segment an audience. You can measure content as an asset through volume of content, or the ability to drive KPIs such as engagement time, new (right-fit) visitors or revenue. Why is brand one of an organization’s most powerful assets? It goes beyond a logo or name, but is an emotional connection between your company and your prospect. The brand is the personality your prospects perceive. Having a strong brand gives you a competitive advantage and long-term profitability going forward. When you shift our brand from tactical execution to strategic thinking, you can see a monumental change in long-term financial performance. You can measure brand through awareness or alignment. Awareness can be measured through formal market research firms, or AdWords can be used in a roundabout way. How well your brand aligns internally and externally can be measured using our brand vector process. How is data a long-term asset? We are talking about audience data. Data helps us do one of two things: Connect with our audience via targeting and permission, or segment our audience so we can get the right message to the right person at the right time. We are either going to put that in a CRM database or a marketing automation database, or stored in third-party databases. Data stored in CRM databases and marketing automation allows for segmentation along psychographic/persona lines, interest/need or buyers’ journey. A well-segmented database gives us create the right message at the right time but does not help us deliver the message because we need permission through opt-in lists. Data opens up access to your prospects email inboxes and various media social media networks. Measure and report on data through the size of your database and the size of first-party audiences. How do these three assets work together? Content, brand and data are a three-legged stool, with each leg supporting the others. If any of these three “legs” are missing, your marketing isn’t viable or stable long-term. Content provides you with the ability to segment your audience and build your first-party audience, and gives you a way to present your brand to your audience in a helpful way. Brand makes your content trustworthy and appealing before it’s even consumed by your audience. Data informs us and tells us what content we should create to cater to our segments and personalize that experience. It also allows distribution of that content. Investing in content, brand and data is an investment in the future success of your marketing. You must invest in all three. Measure and report on these assets to demonstrate where their marketing investment is going. Heart Love PlaceWe hope you want to join us on our journey. Find us on IterativeMarketing.net, the hub for the methodology and community. Email us at [email protected], follow us on twitter at @iter8ive or join The Iterative Marketing Community LinkedIn group.